Living in Paia provides a frequent dilemma: where to eat. We have friends that live on other parts of the island and they mention that they come to Paia all the time: again – to eat. We are blessed with a bevy of outstanding restaurants, and the best news? Most of them are very reasonably priced. I’m not a food writer, I naturally stay away from words like ‘piquant’ and ‘scrumptious’, which is why its taken me so long to write this post. I try to stick with the facts, so here it is: I’ve picked my favorite entrees at each of the main restaurants in Paia, and will attempt to explain why without too many fluffy adjectives. Here’s a fun game. When you have a big, strong, manly-man type house guest (this is the guest that comes when you ‘conveniently’ decide to rearrange all your heavy furniture), bring him to Charley’s for breakfast and explain to him that there’s no way that he can eat an entire PANCAKE. He will promptly order two. About half-way through the top pancake, he will finally admit that you were right, and order a box to take the rest of the pancake home. These pancakes aren’t just large, they are enormous. In fact, they are so big that the servers recommend that you cut out a hole in the middle for the syrup, otherwise it spills over the plate and on to the table. But beyond the size, they are delicious. They have some fluffy texture that is impossible to recreate at home, and come in flavors such as buttermilk, blueberry, macadamia nut, whole wheat and chocolate chip. 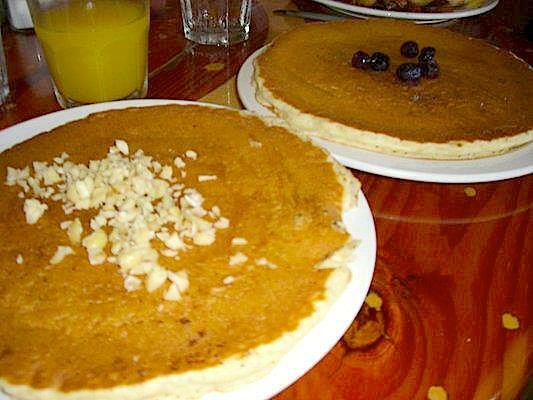 They are served with real butter, coconut and maple syrup. Also don’t miss: Looking for live entertainment in the evenings or possibly some dancing? Hit this place up. This is another great restaurant when you are hungry – the portions are huge. The outdoor patio is prime for people watching, and Paia is one of the greatest towns in the world for watching the world go by. In such a tiny little place, your chances of seeing a celebrity and a naked person in head to toe body paint in the same day are pretty high. Back to the food. 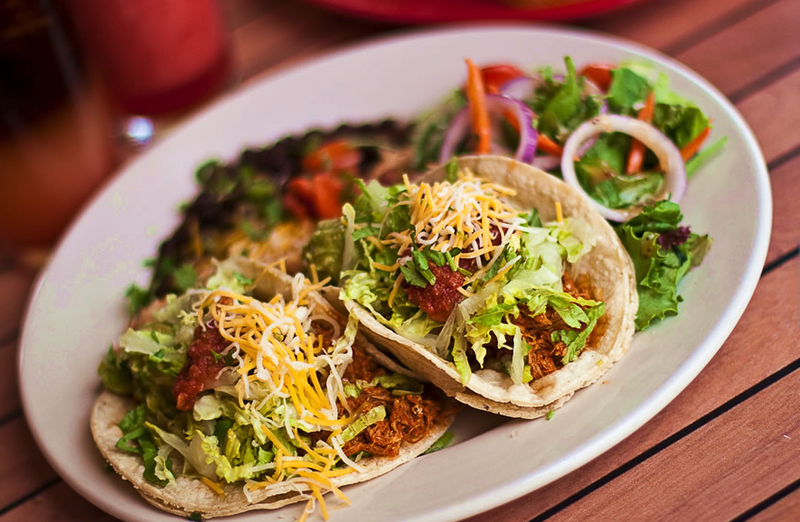 Order a margarita, chips and salsa, and one of their numerous Southwest Meets Maui specialties – the TACOS always hit the spot. Make sure you have plenty of gum ready – their food is delicious, possibly because of the amount of fresh garlic they use. It will become aromatically obvious the next morning. 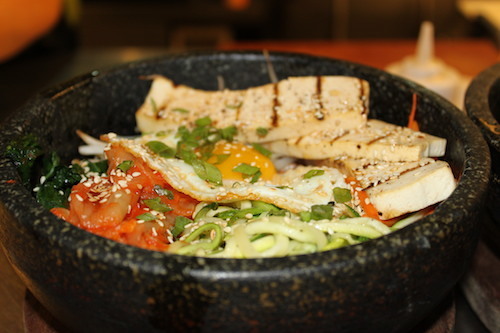 Also don’t miss: Dazoo is also getting attention for its creative cocktails and entertaining bartenders! Cafe Des Amis knows what they are doing, and they do it well. The simple menu – same for lunch and dinner (they also serve breakfast) specializes in Mediterranean and Indian foods, namely crepes and curries. You can order anything on their menu and not go wrong. I am a huge fan of their Shrimp Curry Wraps, but I also love every single one of their CREPES. 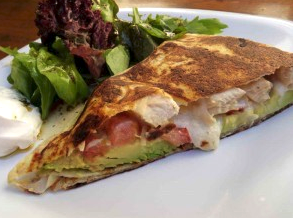 The Chicken Caesar Crepe is a sure winner. If you’ve been on Maui a long time, you still think of this place as ‘the place that used to be Picnics’. But several years ago, Cafe Mambo opened up as a fun, open-air restaurant with a great atmosphere and another opportunity for good people watching. I’ll admit its been a while since I’ve been to Mambo, but I still crave those CRISPY DUCK FAJITAS. 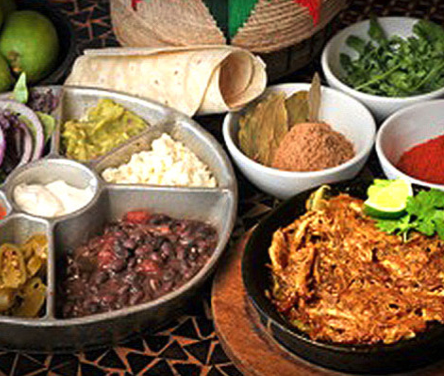 First of all, the duck alone is delicious, but they come with a wide variety of awesome toppings so you can make each fajita a little different, and explore all your options! I would recommend splitting the fajitas for two. For a place called the Fish Market, you should expect well cooked fish. They deliver. The Fish Market isn’t fancy, you wait in line to order and sit family-style at a shared table, but it’s really all about the fish. I’ve ordered one thing here for my entire life (it’s been around since 1989!) – the fish burger – either mahi or ono. The fish is charbroiled, always seasoned and cooked to perfection, and topped with fresh made coleslaw and tartar sauce, tomato and cheese and served on a sesame bun. Something about the toppings puts the whole thing together magically. Also don’t miss: the thin, crispy fries. Order some extra tartar sauce, mix with some ketchup and dip away. You are welcome. 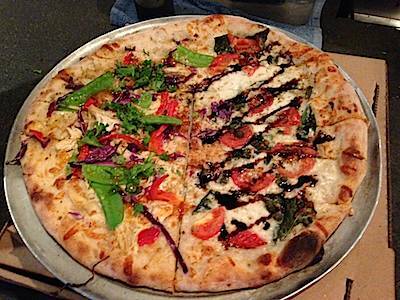 Flatbread is another one of those places that you just can’t go wrong with anything you order. This place specializes in organic and farm to table cuisine, with chalkboard signs filled with the names of all the local farms that provide the meat and produce. The menu is simple – just flatbreads and salads, and the specials are always divine. One of my favorites is Mopsy’s Kalua Pork, with kiawe smoked free-range pork, homemade organic mango BBQ sauce, organic red onions, Maui pineapple, a special blend of Hawaiian goat cheese, mozzarella and parmesan. A few tips? This place fills up. Nightly. Especially on Tuesdays, when they have a weekly benefit for a local non-profit. Go early. Also don’t miss: The salad. To die for dressing – they call it a pineapple vinaigrette, I call it heaven. At the top of this post I mentioned that most of the restaurants in Paia are reasonably priced. This one would be the exception, but if you know anything about Mama’s Fish House, this isn’t a surprise. But I will say this, the place is amazing. 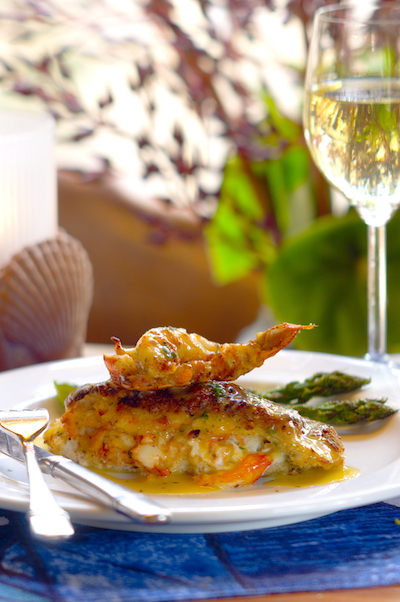 It’s a world-class setting, right on one of the North Shore’s most picturesque beaches, the service is impeccable, the decor is constantly changing, and the food is top notch. 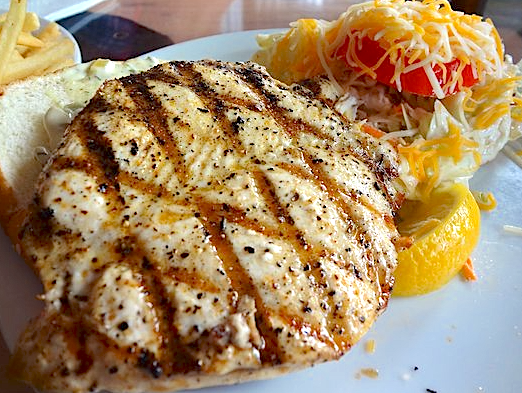 A lot of Maui’s restaurants advertise that the fish is locally caught, and served fresh, but Mama’s is one of the few places that actually buy directly from the fishermen and filet it and serve it up that day. Based on what comes in each morning, the chefs create an entirely new menu, complete with the names of the actual fishermen or the vessel names on it. How do I know this? My husband is one of the fishermen. He brings our three year old along on the mornings he sells his fish, an assistant job he loves now that he’s figured out how to con cookies out of the pastry chefs. So, next time you dine at Mama’s Fish House, look out for fish caught aboard the Sweet Alexandra, and enjoy your fish, knowing that you are eating the freshest possible fish- just like the fishermen enjoy. We go there about once a year, typically for a special occasion like an anniversary or with out of town guests. I sometimes switch it up as the menu is always changing but one classic fish dish that’s always on the menu is the STUFFED MAHI MAHI, with a decadent lobster and crab filling and a sweet and crunchy macadamia nut crust. Also don’t miss: World-class Mai Tais, and the Polynesian Pearl dessert is a must for chocolate lovers. And for the other ‘sit-down’ restaurants missing from this list in Paia – Fresh Mint just closed this week, and I haven’t yet been to Rock n’ Brews. What is your favorite meal in Paia? Blogging Disclaimer: I am a paid consultant for Dazoo, but the opinions are my own.